We're just starting to get updates from the action at Stafford Motor Speedway now. Apparently the inspections went smoothly, but cars started to disintegrate as soon as they touched the track. According to LeMons Assistant Perpetrator Nick Pon, the Peugeot 504 sputtered to a halt and had to be pushed off the track two laps into transponder testing (which takes place at about 30 MPH, so you know that the weekend will be full of excitement for the Peugeot team if they can get the car out there during, like, real racing). The Team Craptation Chevy Citation X-11 lived up to all the advance billing and crapped out minutes later. The eagerly anticipated first-ever LeMons Datsun 510 fried its alternator and had to limp off the track, according to tweets from Team Knights Who Say Ni-ssan… whose 200SX has already lost an idler pulley. Not only that, the Team Crumpled Rusted And Pathetic Plymouth Laser just shed a wheel on the track, with unpleasant results. 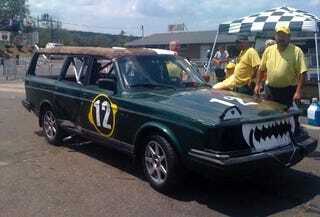 One Week Until 24 Hours Of LeMons New England, Peugeot 504 Will Race! On the positive side, UDMan's '63 Corvair hasn't missed a beat, continuing to rack up lap after lap. It's too early for Team Trailing Throttle Oversteer to start measuring garage shelf space for the Index Of Effluency trophy, but things are looking good for them so far. We'll be passing along photos and updates as they come in from Connecticut, so check in later!